You'll be hooked on these rich comfort drinks that are guaranteed to put a smile on your face. A Hong Kong favorite is finally on Philippine shores! What's your comfort indulgence? A warm cup of coffee at the start of the day? Or maybe a mug of hot chocolate after a stressful week? For those of you who have a taste for unique, rich flavors and are craving something new yet familiar, there's a cozy little cafe that offers just the thing you need. Happy Lemon is a Hong Kong-based drink shop brought to the Philippines by a group of friends from Ateneo, who have discovered it during their travels and grown to love it. Happy Lemon has over 100 branches worldwide, with the first local branch having opened at the Promenade in Greenhills only last November. Due to its immense popularity, new branches are already being planned for Eastwood and Powerplant Mall. But, what makes Happy Lemon different from all the other beverage hubs cropping up lately? Athlete and TV host Chris Tiu, head of Happy Lemon's Marketing and Business Development, says, "First of all, everything is fresh. The products, they're all made from freshly brewed tea, so the flavor is more distinct. Plus, the products are very unique. The company spends a lot in and research and development, so they're really [high] quality. It's not like other brands that are mostly powdered lang." He explained that while most fast drink providers are for to-go orders only, the group wanted Happy Lemon to be more of a homey place with a warm, welcoming ambiance. "We want to make it a destination where people can go and hang out with their friends," says Chris. "Instead of going out on gimiks at night or drinking alcohol, go here na lang. Wholesome tayo, 'di ba? Healthy pa!" 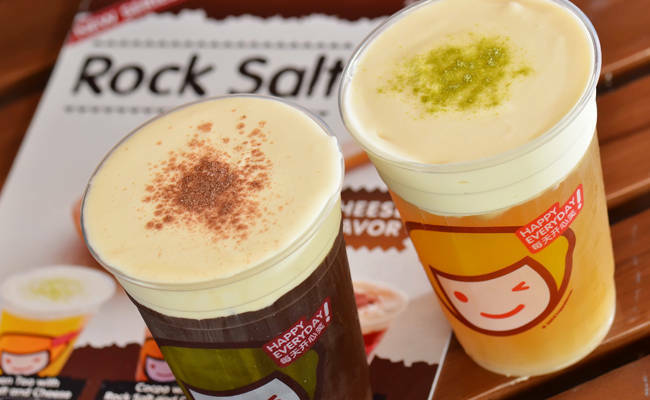 Among Happy Lemon's diverse range of products are classic Milk Tea drinks with quality toppings such as Adzuki Bean, pudding, crispy cocoa, brown sugar jelly, and Oreos. Their Lemon Series features Chris's favorite drink, Lemon Yogurt with Aloe. Those of you who want something more refreshing should try their Fresh Teas that are infused with fruit flavors and Pinoy-fave Yakult. To get your daily dose of sweet caffeine, choose from the Cocoa and Coffee line enhanced with Italian Blood Orange, Oreo, Taro, and Mocha flavors. Their Specialty Drinks are alternative options for those of you with curious palates. Try a hot cup of Matcha with Malt or Passion Fruit Yogurt with Nata de Coco! Kids also have a great selection to choose from in the Mousse Spin line of creamy and fruity smoothies. Their newest limited edition selection is the Blueberry Mousse Spin with Popping Boba, which they're specifically offering for summer. Popping Boba is a sago-like topping that explodes in your mouth, filling it with flavorful yogurt juice. It's a really fun choice for children and those who enjoy the novelty of the popping topping. But, if there's one drink we absolutely dare you to try, it's the Rock Salt Cheese on either Green Tea, Cocoa, or Coffee. While you may be skeptical of the combo, this is definitely something that has to be tasted to be appreciated. Sip the creamy concoction straight from the cup instead of through a straw, as Chris recommends, so the flavors will glide smoothly into your mouth and blend in a unique way. Happy Lemon has done so well in the few months since it opened because of their creative and healthy approach to beverages. Their drinks have no added or artificial preservatives. They are affordable, with drinks costing between P60 and P110. And best of all, they provide a fun, family-friendly destination where you can bond over good company and great, comforting treats. Visit Happy Lemon with your loved ones at the first level of Promenade, Greenhills Shopping Center, San Juan. They are open on weekdays from 11AM-12MN, and until 1AM on weekends. View the gallery for a review of drinks that we recommend for you! Plus, watch for our feature on CHRIS TIU tomorrow in Male Celebrity Spotlight!